Interest in the Monster Meeting continued to build, but discussion about the actual design of the Diggers Flag was a handicap. Letters published in local papers and a query in the Weekly Times about the flag design and colours brought no responses, so a group auspiced by the Chewton Domain Society (CDS) set out to draw up the “best possible” artistic representation of the flag. Working from what could be made out from the Tulloch drawing they came up with a design that was based on what was known and recorded about the goldfields life in late 1851. A design was settled on and National Signs and Flags in Geelong was contracted to produce them. The four quadrants depicted a pick and shovel that spoke for the value of labour, a bundle of sticks that stood for unity, a kangaroo and emu showed the allegiance of the diggers to a new land and new ways and a set of scales called for justice for all. Over recent years the CDS has been selling these at cost price, and one flies on the flagpole on the Pyrenees Highway in Chewton. Geoff Hocking gave some consideration of the Digger’s Banner in an article published in the Bendigo Magazine. A slightly appended version of that story (including some more Chewton specific references) follows. There is some dispute over a recreation of a design for the Diggers Banner. 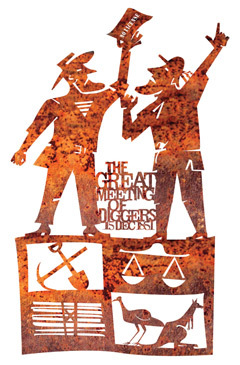 One interpretation of the design, which is proudly carried today by Bendigo citizens in their annual commemoration of the diggers’ protest, the ‘Red Ribbon Rebellion’ march upon the ‘Police Camp’, on aptly named Camp Hill each August. Another flies from a flag-pole beside the road at Chewton, close-by the site of the ‘Great Meeting of Diggers’ which took place in 1851, two years before Bendigo’s march of protest and well before the final battle at Eureka. When Governor Hotham wrote ‘…we live in times of restlessness and desire for political change… the growing sense of importance and independence arising from unexampled prosperity, emancipation from old ties and obligations… and (ideas) of self-support and self-government’ he was responding to the threat to the authority of ‘the Crown’ over the diggers on the Bendigo goldfields. The diggers had risen in protest of what they claimed to be unfair taxation in the guise of the heavy licence fee imposed on all who were on the diggings, whether they were engaged in looking for gold or not. The fee was very high, out of all proportion to the average expectation of daily earnings and was so pitched to force diggers away from the free-wheeling life on the diggings and back to work on the farms or in the workshops as labourers for the ‘right kind of people’ – the squatters and merchants who made up the ruling class. A spirit of democracy was growing on the diggings, and the first protests began in Chewton, near Castlemaine, where more than 14,000 diggers turned out to protest against the government and the hated licence at the ‘Great Meeting of Diggers’. It was at Chewton that the Digger’s Banner (flag) was first raised but little is known of its design save for a tiny detail in a sketch drawn by Thomas Ham who was witness to that meeting. Attempts have been made to develop a design based upon Ham’s drawing, but reference from Ham’s hand-coloured engraving, which was first published in 1852 in his ‘Fine Views of the Goldfields & c’, can lead the unwary up a difficult path. The fact that such engravings were printed in black should cause a degree of caution when taking the coloration of such images too literally, as it is most likely engravings have been coloured many years after they were first published at a time when such sets of engravings were often split up to be sold as framed pictures in the antique trade. Ham’s engraving is very indistinct showing only the pick and shovel in any detail. The references used to create the flag design often promoted as an accurate facsimile comes from William Howitt’s description of the Digger’s Banner, carried at the march on the Government camp in Bendigo in August 1853, in his book ‘Land, Labour & Gold’ which was published in 1855. Howitt was an eyewitness to the Bendigo march, later to be known as the ‘Red Ribbon Rebellion’ and described the flag carried that day as “show[ing] the pick, the shovel, and the cradle, – that represented labour. There were the scales, – that meant justice. There was the Roman bundle of sticks, – that meant union. There were the kangaroo and emu, – that meant Australia…’ (page 224 Land, Labour & Gold). Investigation into styles and designs of the period can lead to the conclusion that flags designed for both re-enactments of the ‘great meeting’ in Chewton, and as once displayed in the Bendigo Visitor Information Centre, at the Old Post Office may well be inaccurate. The Chewton flag shows what would seem to be contemporary graphic symbols. Such symbols, even when used in traditional heraldic designs in the English tradition were quite unlike the symbols common in the modern age. Heraldic symbols still retained modeled descriptions even in their simplified forms. Graphic symbols did not come into common usage until the age of mass-manufacturing late in the nineteenth century. Most manufacturers’ symbols persisted in modeled description well into the twentieth, with ‘graphic’ symbols or logo-styles as we know them today not evident until the post-WW2 period of ‘modern-design’. It is likely that the flag flown at Chewton was not the same flag carried in Bendigo, but it is also likely that the two flags carried similar designs, as the same concepts ran through both protests. The pick and shovel were described by Howitt. One of the best examples of these implements is shown on the grave-stone of Robert ‘Pump-handle’ Benson, a well-known agitator on the goldfields from Castlemaine to Bendigo, who is buried in the White Hills cemetery. One attempt in celebration of the 150th discovery of gold in Bendigo showed a prospector’s pick, which could not have been further from the reality than could be imagined. Diggers brought up any garden implements they could lay there hands on. They were bank-clerks, lawyers, doctors, coster-mongers, layabouts and larrikins – they had no prior knowledge of gold-digging, and the prospector’s pick, a specialized tool would not have been readily available to them. Howitt also describes a rocking-cradle, but that cannot be seen on Ham’s engraving. I would guess that the flag on that engraving was so small that any other detail would just confuse the image too much and make it unreadable. The notion of the Roman bundle was present in the oratory given at Chewton. One speaker at the ‘great meeting’ said, “Remember that union is strength, that though a single twig be bent or broken, a bundle of them tied together yields not nor breaks.” Such descriptions of the Roman bundle were still to be found on town signs in fascist Spain up until the 1970s. Also known as a centurion’s bundle this design based is in classical antiquity, representing strength in unity; each bundle had 100 sticks, and if a man died a stick was removed. The sticks are known as ‘fasces’, the Latin root which gave the world the word ‘fascist’. It is unlikely that Howitt would be referring to ‘le fagot’, or faggots (kindling), although the origin of the word is much the same. Graphic drawings representing twigs, or litter [kindling] have been used in earlier attempts at re-creating this flag design, and this would not be the correct symbol for the required meaning. The description of the scales on the Chewton flag represent gold scales, where Howitt clearly refers to the scales of justice. As an Englishman Howitt would have been considering the scales of justice as depicted on the court of the Old Bailey in London. Here a sculptural figure, ‘blind justice’, is shown holding a pair of scales in one hand a sword in the other. The scales are held between thumb and forefinger, the same way pocket-scales would be held, gold scales with a supporting centre post as shown on the Chewton flag do not represent the concept of justice. The Kangaroo and Emu were not depicted in any common designs at that time as facing one another until Australian Federation, when they were turned inward to support the Australian coat-of-arms. Early depictions have shown them to be back to back. Even Robert Bowman’s flag, the first to show a kangaroo and emu, created in New South Wales in 1806 in celebration of Nelson’s victory at Trafalgar shows the native fauna turned away from each other. The Advance Australia Banner depicted by S. T. Gill in his watercolor ‘The Subscription Ball, Ballarat’ c.1853 shows them also facing away from a crest. It can be suggested that the attitude of the kangaroo and emu should reflect the British coat-of-arms, which shows the Unicorn and Lion looking away from the central crest. There is no evidence to suggest that the kangaroo and emu shown on the digger’s banner should be drawn as contemporary symbols or in the attitude as expressed at Federation in 1901. Even the shield/logo for Laucke Flour, an Australian miller established in 1899, shows the kangaroo and emu with their backs to one another. Howitt’s evidence indicates that the diggers flag was red; that Mr Dexter, the artist, had been a china-painter from Devon; a man known to mix his own paints from locally collected pigment. It can be surmised that he was more likely to paint designs similar to the decoration on ceramic ware of the period, or at least in the style of the worker’s banners carried by ‘unionists’ in the protests of the British chartists in the early years of the nineteenth century, before the rush to gold. It would appear that any interpretation of the flag should reflect what we know of the history of decorative styles, of technique, and imagery contemporary to the time. ‘The Great Meeting’ to the ‘Red Ribbon Rebellion’ they need a banner as bright, and as thoughtful in the interpretation of its meaning, as that flown in another large Central Victorian gold-fields city, and they need to fly them from the highest flag-poles, after all the Bendigo and Chewton agitations were bigger, better armed and better organized than that other one in 1854 – just no one got shot. Geoff Hocking has also written books about the Chartists and The Red Ribbon Rebellion. One is called The Rebel Chorus, where Eureka is taken as the centre of the book then going back to Ireland and the Scottish Martyrs, and then forward to the New Guard and the present age, the Republican argument, et al. The other book is called The Red Ribbon Rebellion.